Since most Charlotte sports fans were likely watching the Carolina Panthers run all over the Tampa Bay Buccaneers (literally) in the Monday Night Football game, you probably didn't see the Charlotte Bobcats play the Miami Heat. The Bobcats lost a close one, 100-96. It continues to be nearly exact this season that when the Bobcats score more than 100 points they win and when they score fewer than 100 points they lose. Dwyane Wade lit it up for 41 points, but two in particular will be talked about and replayed for a long time to come (look for it to live in YouTube infamy). After grabbing a rebound, Wade drove the length of the court, suddenly accelerated and dunked on Emeka Okafor in a manner that is sure to end up on a poster (Okafor got posterized!) or on a basketball card next year. And here it is on candid camera. No disrespect, Okafor. You're a great player and a great guy who does a lot for the community (especially your AIDS initiative). 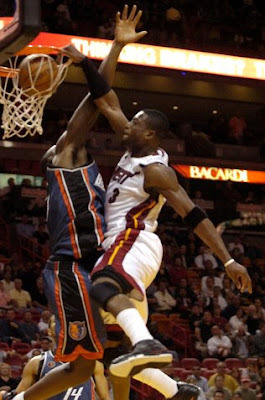 But we sports fans love to see dunks like this. Even if it is on players we like.